It was Arthur Condo (see The New Adventures of Arthur Condo on Twitter and, eventually, here on the Art Condos blog) who took this misty, rather romantic photo of the crane atop the rising Art Condos building on Dovercourt Avenue. This is the same crane the unflappable Rebecca Daniels climbed (see Rebecca and the Crane) during the time when the strings of blue lighted letters spelling out A-R-T were being installed on the crane. 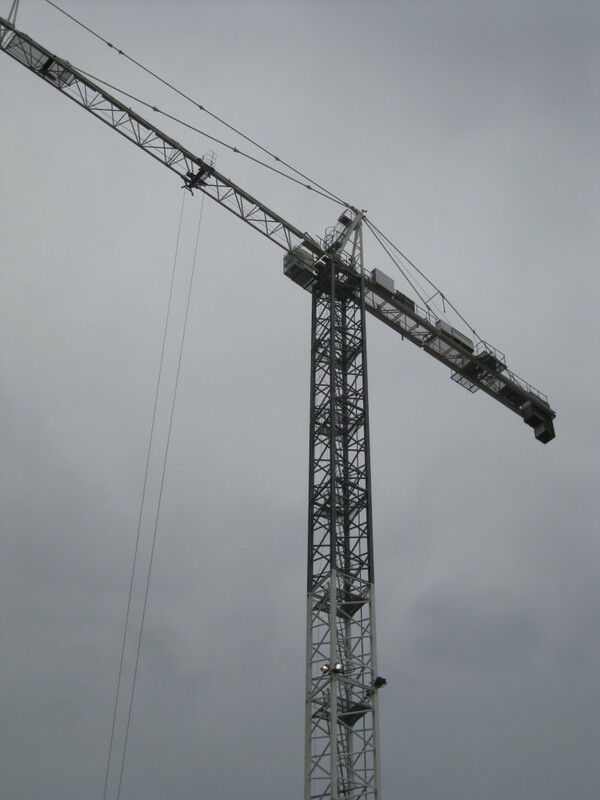 Arthur Condo took his photo of the Art Condos crane on a drizzly grey day in early November. He told us he thought a construction crane was one of the most beautiful things he knew. It was lean and logical, he said. Everything about it, he said, has a reason-for-being, and every part of it—each strut and spar—was essential to its strength and performance. It would be good sculpture, if sculpture were efficient, and not just decorative. “You know what I like best about the crane?” Arthur asked us. We said we couldn’t imagine. “It has no style,” he said. “But you said you thought it was a beautiful thing,” we reminded him. “It has no style,” Arthur agreed. “Because it IS style!” We couldn’t think of a good rejoinder.